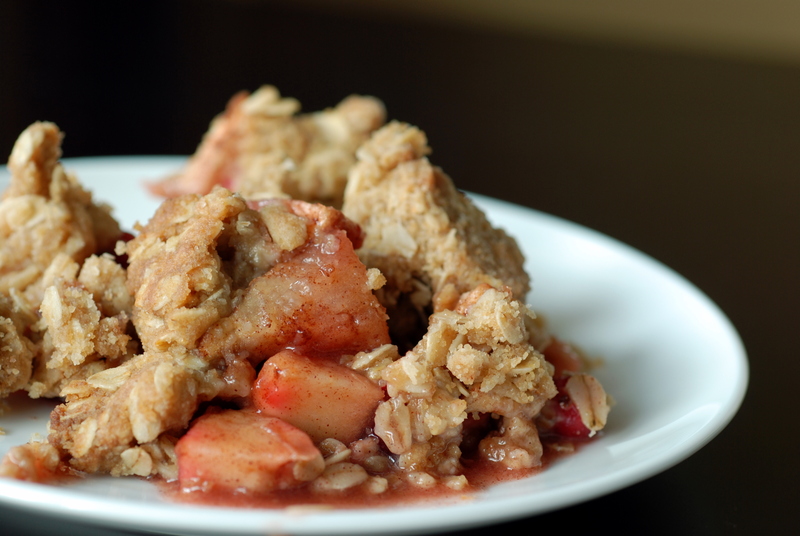 Who needs another apple crumble recipe? It is such a simple, wholesome dessert, I am sure everyone has their own family recipe. I tried this one, courtesy of Rustic Fruit Desserts and really enjoyed the combination of tart fresh cranberry with the sweet apple. 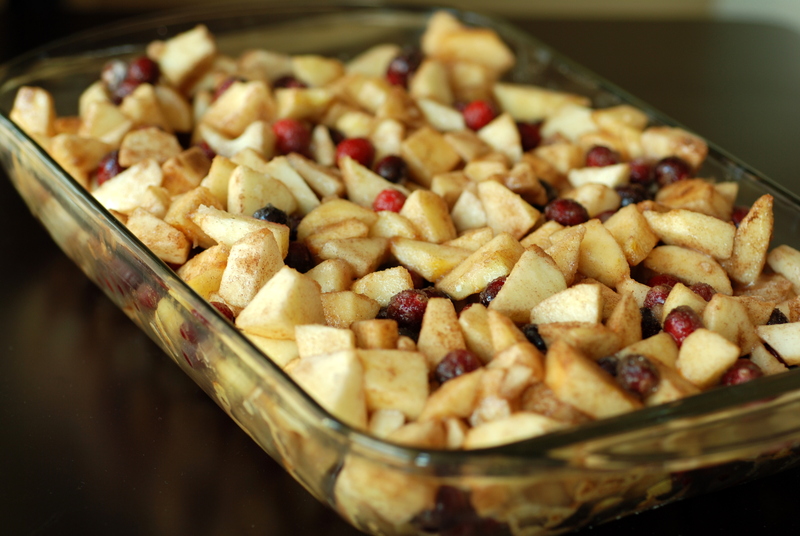 Enjoy cranberries with your own recipe. If you try this one, beware it makes a ton. As you can see, it was nearly overflowing from my 9×13 pan. Halving the recipe would be reasonable, unless you are feeding a small army. This is my submission to December’s Monthly Mingle featuring Winter Fruits and Vegetables. 1. Preheat the oven to 375F. Butter a 3-quart baking dish (I used a 9×13″ glass dish). 2. To make the topping, mix together oats, flour, brown sugar and salt into a bowl. Stir in teh butter and press together to make small clumps. Store in the freezer as you prepare the filling. 3. To make the fruit filling, toss togeher the apples, cranberries, sugar, cornstarch and cinnamon together in a large (LARGE!) bowl. Spread it out evenly into the buttered baking dish. 4. 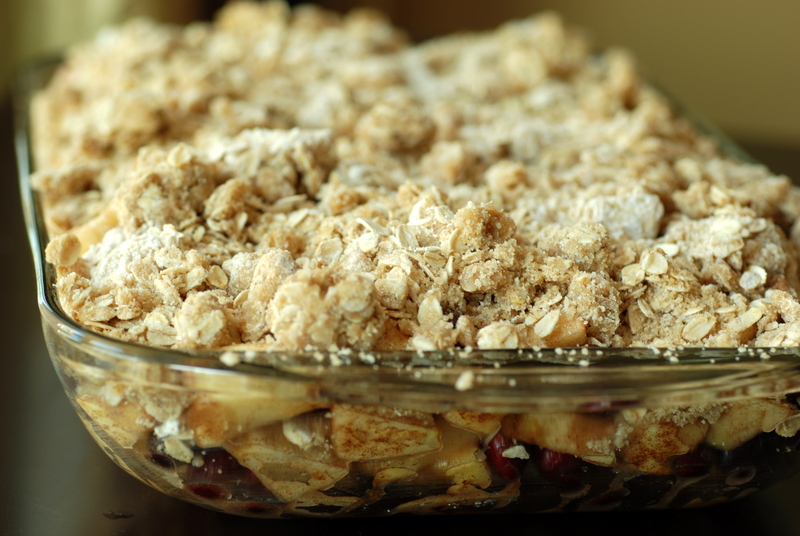 Press the oat crumble evenly over the fruit and then bake for 60-70 minutes, or until the crumble is lightly golden and the filling is bubbling. Cool for 20 minutes before serving. Serve with ice cream. The crumble is best served the day it is made, but apparently the leftovers can be wrapped in plastic wrap and kept at room temperature for 2-3 days. I kept mine in the refrigerator. Reheat at 300F for 10-15 minutes, until warm. 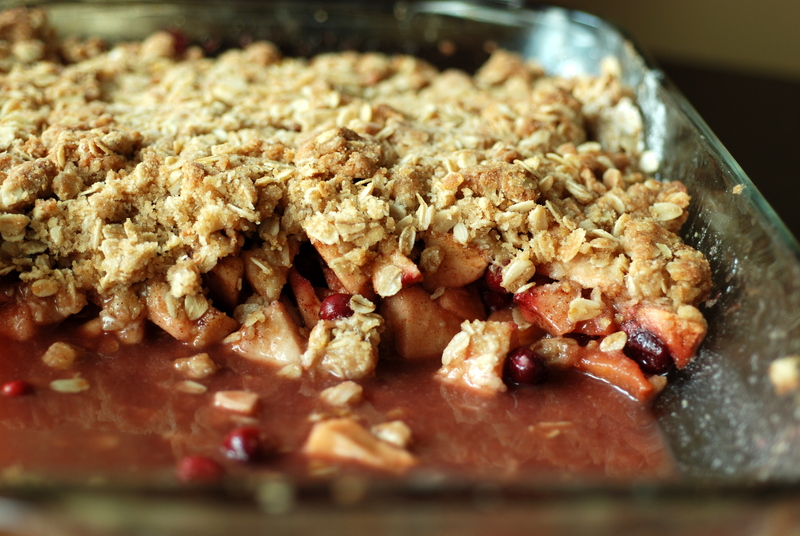 I made a butternut squash bake with apples and cranberries not so long ago and adored the combination! This looks amazing. Your pictures are awesome.